I never need an excuse to buy new makeup but if you do, Spring has arrived so it's time to get some new products to play around with! 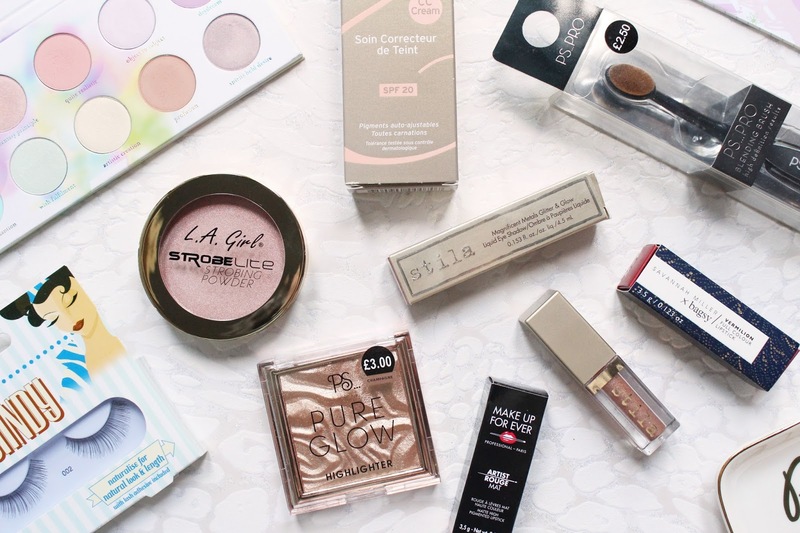 I have been buying far too much makeup recently and these are some of the new products I have been putting to the test. There is something for every budget too as I have products from £2.50 to £25 I am trying. 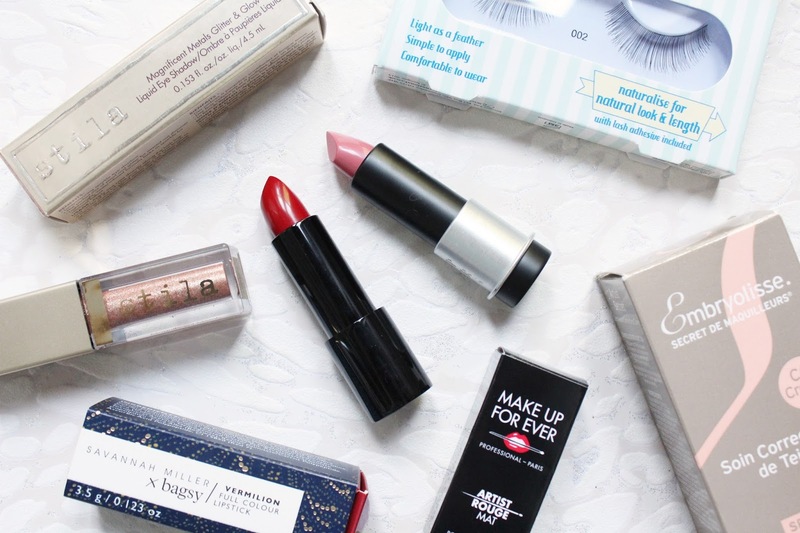 Lip products are my favourite and even though I have a drawer full, I can't seem to stop buying them! The same goes for highlighters. The two new lip products I have added to my collection for Spring are the Savannah Miller x Bagsy Lipstick in Vermilion Red and one of the Artist Rouge Mat Lipsticks from Make Up For Ever in M200. The lipstick from Bagsy is going to be perfect for when I want a dramatic red lip as it is very bold but perfect for a statement. The MUFE Lipstick I can already still is going to be a must have in my handbag as it is my perfect everyday shade. Even though both lipsticks have different finishes, they are very comfortable on the lips. I have been on a highlighter kick lately, I ordered the Manny MUA Skin Frost and I have been obsessed with it. 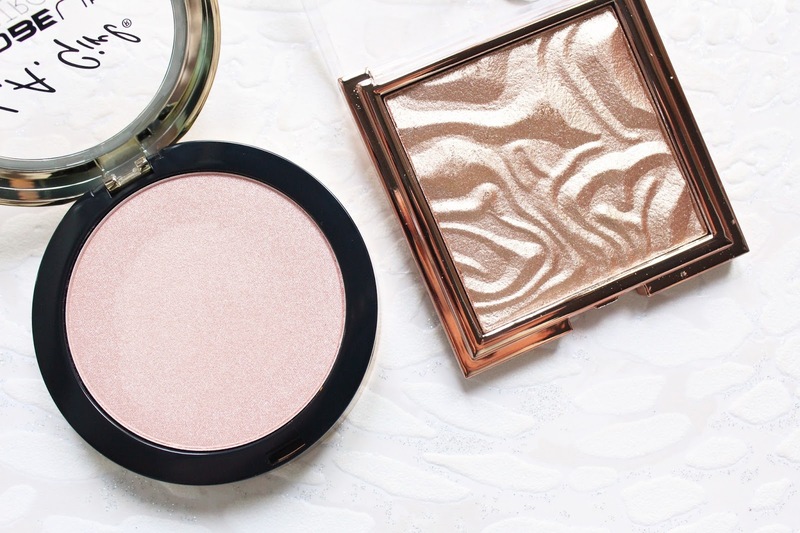 But for affordable highlighters, you can't go wrong with the La Girl Strobe Lite Strobing Powders, I have the shade 70 Watt and I have been wearing it a tonne! It is such a pretty shade and applies beautifully to the cheek bones. Surprisingly, Primark has some amazing makeup and shouldn't be overlooked! I picked up one of the Pure Glow Highlighters in Champagne for £3 and I have been so impressed! It is so pigmentated and glowy, I hope they bring out a few more shades! Another bargain I picked up while I was in Primark was the smallest contour blending brush for £2.50, it is great for blending concealer under the eyes to ensure that it doesn't crease throughout the day. I have one of these brushes which looks exactly the same and was probably around £20 and I prefer my Primark one! For the eyes, I have a couple of new things I have been trying out. While I don't wear eyelashes all of the time, I do like to experiment which is where the Eye Candy Lashes. In the Naturalise style, they look very natural on the eyes and are comfortable to wear and super lightweight. Another eye product I have been obsessed with is the Stila Magnificent Metals Glitter & Glow Liquid Shadow in Kitten Karma. These liquid eyeshadows are incredible and worth the £23.50 price tag, they are super sparkly so if you don't like glitter you might want to stay away from these. If you like to use colour eyeshadows and are looking for a pastel palette, I highly recommend the Zoeva Sweet Glamour Eyeshadow Palette. It has the prettiest pastel shades and they are actually quite wearable. During the warmer weather, I don't like to wear anything too heavy on the skin which is where the Embryolisse Complexion Correcting Care comes in. It gives the skin a hint of colour as it is a CC Cream and has SPF 20 to help protect the skin against sun damage. This post contains press samples and affiliate links, all opinions are my own.